This one is a new dish for me and was told to me by my mother in law. She makes it once in a week. People who don't like bitter goud will start liking it. It has to be taken with plain rice. =►Take small bitter gourd(2 ½ -3inch), make one side slit and remove seeds. =►Heat 2tsp of oil in a pan, add fennel seeds and allow it to crack. =►When it cracks add finely chopped ginger & garlic into it. =►Sauté it well till the raw smell of garlic goes off. 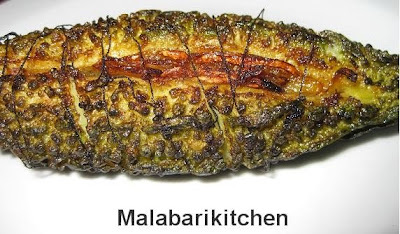 =►Add finely chopped onion, salt and curry leaves and fry it well (golden brown). 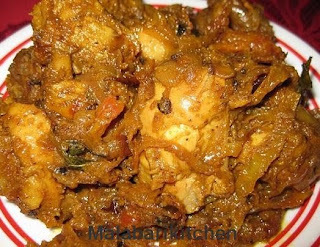 =►Add turmeric, chilly, coriander and garam masala powder into it. =►Stuff bitter gourd with cooked masala mixture. =►Tie the bitter gourd tightly with a thread so that the masala doesnot comes out. 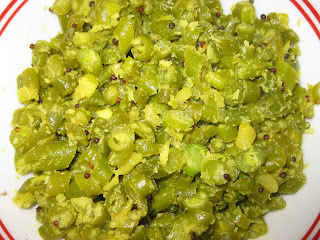 =►Heat 4tsp of oil in a pan, put stuffed bitter gourd into it and close it with lid. =►Fry it on medium flame. Make sure to fry both the sides. Keeping it closed with a lid makes it easy to be cooked easily. This looks yummy.. I dont like bitter gourd so much but i am tempted to try this as it has some yummy stuffing inside. A very nice way to eat bitter gourd. Nice recipe.. thanks for sharing..